ATOMIC wants to cast you in our annual Student Showcase! 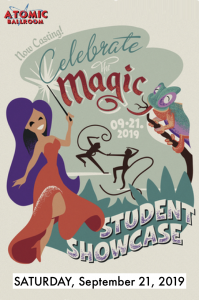 Our Theme is “Celebrate the Magic” which is open for your creative interpretation! -Dress rehearsal, tech rehearsal, matinee and evening performances. -State of the art lights and sound. -Professional theater staff and stage crew. -Dressing room and green room. -Choreographed opening routine for the entire cast. -Videos of your routine uploaded to Youtube. -After-party with friends, family and teachers featuring desserts and social dancing on stage! -Professional & Amateur, Amateur & Amateur, and Group performances. $100 deposit reserves your song. Balance due September 1st.